There's a puncture waiting with your name on it. Continue driving for 50 miles at up to 50 mph*. The innovative Bridgestone DriveGuard technology allows you to maintain control after a puncture and safely continue driving for 50 miles at up to 50 mph* until it’s safe to either repair or replace your tyre. 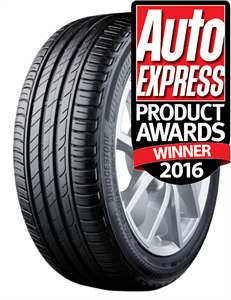 Bridgestone DriveGuard tyres are classified Wet Grip A in EU labelling, the highest wet grip performance with short braking distances*. Designed for any passenger car with a Tyre Pressure Monitoring System (TPMS). When the indicator on your dashboard lights up, you can safely continue driving for 50 miles at up to 50 mph*. This makes Bridgestone DriveGuard the ideal companion for just about any situation on the road. Thanks to our proprietary patented high-tech cooling fin design, Bridgestone DriveGuard tyres redistribute heat and friction after a puncture, so you can keep driving up to 50 miles* even after a complete loss of air pressure. Whatever the puncture, DriveGuard keeps you going. Bridgestone DriveGuard helps protect you against all types of punctures that are waiting on the road. * Driving distance after a puncture may vary depending on vehicle load, outside temperature, and when the TPMS is triggered. Bridgestone DriveGuard tyres are classified Wet Grip A in EU labeling. DriveGuard tyres are currently not available for vans, and are only available for cars equipped with a Tyre Pressure Monitoring System (TPMS). Quick tyre change. Honest guys and great prices! Fab guys there. Seem very friendly, professional, helpful and honest. Repaired one tyre and ordered in the other tyres to fit and do tracking the next day. Wouldn't let me pay for the repair until it was all done. How trusting is that? Wow! Friendly, with great service and price.